This view looks southwest along Carson Street, at the corner of Proctor. Sierra Land Title is occupying the old bank building on the corner. The two-story Eagle Market used to be on that site until it was demolished in the 1960s. 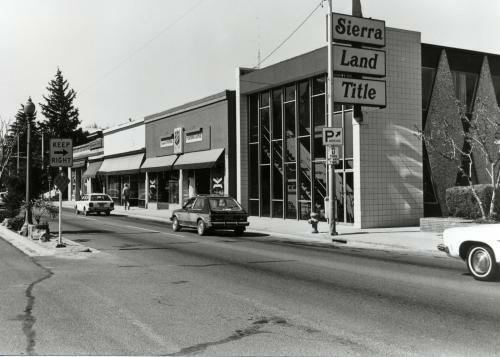 Next to Sierra Land Title is the Salvation Army Thrift Store during the time when they had a downtown location. At the far left corner of the block is the Geo. H. Meyers Hardware store.